Time for another edition of Craving Ellie in My Belly! 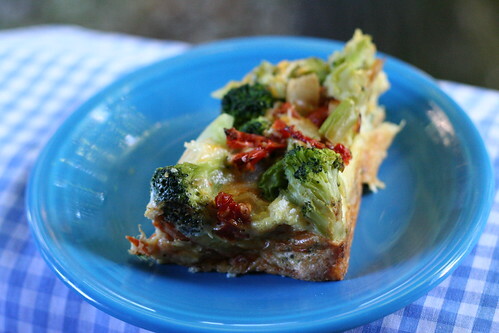 This week's Ellie Krieger recipe is Vegetable Cheese Strata, hosted by Jenn at A Mid-Life Culinary Adventure. Making this dish was a ridiculous comedy of errors for me. I realized much too late that it needs to be refrigerated for 8 hours (or overnight) before baking. When I finally found a span of time that worked for me to make it, I decided to prep it first thing in the morning, with the intention of eating the strata for dinner that night (I'm a big breakfast for dinner proponent). I hadn't had my coffee yet that morning, which means I was pretty much not functional when I tried to make this. As a result, it took me twice as long as it should have, and I was even an hour late to work (luckily I have a very accommodating workplace)! Yes, it was that bad. The way I was shouting "OH CRAP" and other, more colorful expletives every minute or so, poor Andy thought I kept hurting myself (as I am prone to do). It was just one of those mornings, I couldn't get myself together. I halved the recipe, which is always dangerous because I inevitably wind up using the full quantity of something as I follow the instructions. This time, it was broccoli. Oops. Other substitutions: I omitted the mushrooms (Andy's #1 most hated food), added some cayenne pepper, omitted parmesan (I ran out, sad day! ), used a Mexican cheese blend instead of mozzarella, and used a white baguette instead of whole wheat. Oh, and I left the broccoli florets whole instead of chopping them. I was worried after I poured the mixture over the bread, because it didn't look like there was enough eggy moisture to cover the chunky stuff. Andy assured me that the eggs would puff up during baking, and he was right. What a smart guy! I thought about making strata muffins, but decided not to push my luck with this one. I liked this dish a lot (especially the sundried tomatoes), and I'm all for the idea of cheesy-veggie-egg-covered bread in theory, but I might be permanently scarred from my high-maintenance morning. Next time maybe I'll just make a omelet and some toast and call it "Strata Deconstructed." As always, click here to meet the other CEiMB bloggers and see how their stratas (stratae?) turned out! 1. Heat 2 tsp of the oil in a medium nonstick skillet over medium-high heat. Add the onion and cook, stirring, until softened and beginning to brown, 3-5 minutes. Add the garlic and continue to cook for 1 minute. Transfer the onion mixture to a medium bowl and let cool. 2. Heat the remaining 2 tsp oil in the same skillet over medium-high heat and cook the mushrooms, stirring a few times, until their water evaporates and they begin to brown, 5-7 minutes. Remove from the heat and let cool completely. 3. Coat a large baking dish (9x13 inches) with cooking spray. Arrange the bread cubes over the bottom. In a large bowl, beat the whole eggs, egg whites, milk, and mustard together until incorporated. Add the mushrooms, onion-garlic mixture, broccoli, both cheeses, sun-dried tomatoes, thyme, salt, and pepper and stir to incorporate. Pour the mixture over the bread, making sure the liquid saturates the bread. Cover with plastic wrap and refrigerate overnight or at least 8 hours. 4. Preheat oven to 350F. Remove plastic wrap from the strata and bake until the top forms a light brown crust, 60-70 minutes. I think it looks wonderful. If you hadn't shared all the trials and changes you made, I'd never have guessed it didn't go smoothly! (did the same thing as you and prepped it in the morning, but my recipe really needed to sit overnight, so it was all soggy)... I think maybe you've inspired me to try again. Looks great! I did the same thing... looked at the recipe prep. time too late. 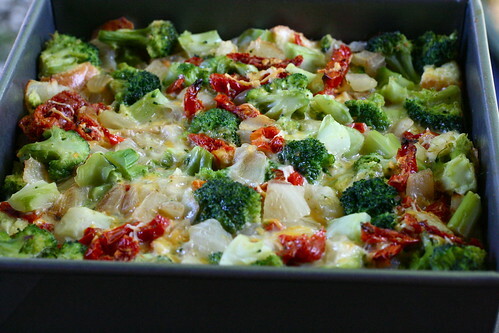 I ended up changing it to a frittata and messed the whole thing up..according to TEd. Despite any issues you encountered, it looks like your strata came out perfectly! Nice work getting it together...I can totally relate to those times when you feel like everything just keeps going wrong, but you totally made it work!! It looks really good. The sun dried tomatoes WERE so good in this! I can understand the frustrations though, sometimes you are just off in the kitchen. This is definitely a weekend meal for me, I would never attempt to get this done in the morning before work. That would be asking for disaster. "I'm a big breakfast for dinner proponent"
I couldn't be more on board with this. Sometimes it's eggs, others pancakes, throw in an occasional waffle, and this is a huge win. I like the muffin idea, if they stayed well it would be perfect on-the-run breakfast to eat at work. I do think the portioning might get a little tricky though. It's great that you can laugh after having such a time making this! Strata muffins are a great idea! Looks fantastic! 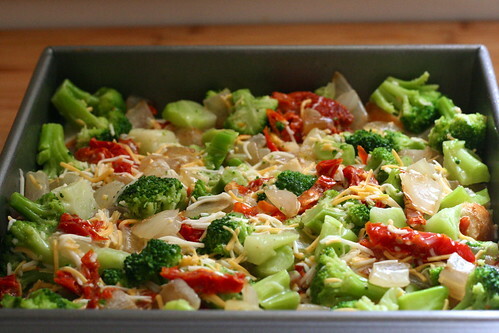 So colorful and the extra broccoli is a good thing in my book. :o) Have a great vacation!